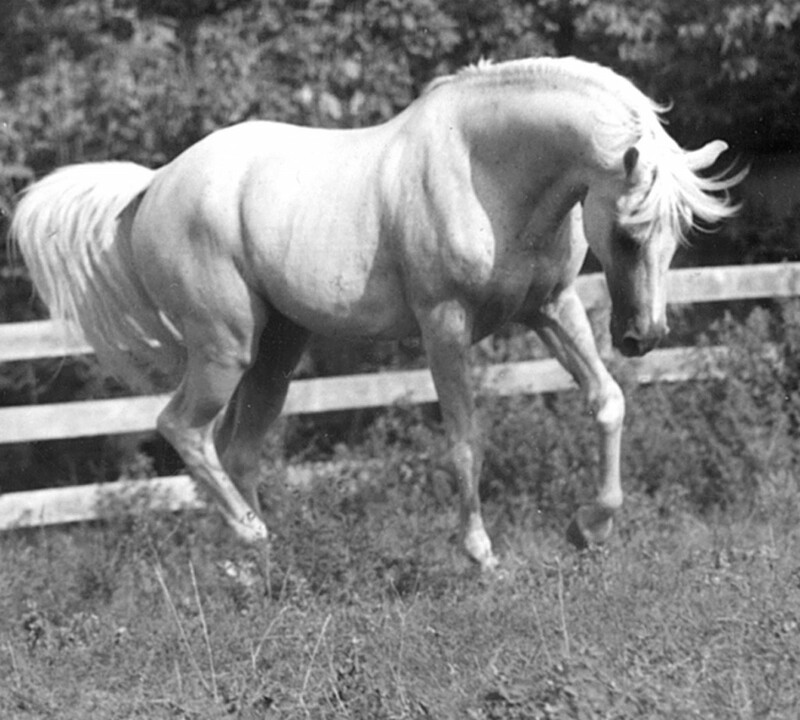 The Davenport bloodline is one of the original bloodlines of American Arabian breeding. In 1906, before there was even an Arabian Horse Registry, Homer Davenport realized his boyhood dream of traveling to Arabia and buying Arabians directly from the Bedouin horse breeding tribes. Davenport was not the first English speaking importer of foundation Arabian bloodstock. Starting just over 30 years before Davenport’s trip, in the 1870’s, a few people from England traveled the same desert regions and bought Arabian horses from the same tribes. These people – notably Roger Upton and the Blunts – put their travel experiences and Arabian horse lore down in books. Upton and the Blunts had apparently learned much from James Skene, British Consul in Aleppo since the 1850’s. Davenport made use of the Blunt and Upton books in planning and executing his own trip. He learned the names of the principal horse breeding tribes, the various family or strain names of Arabian horses, and to insist on a sworn attestation of purity and breeding – known in Arabic as a hujja – for each horse purchased. Davenport left the United States in July. By what has been described as a series of fortunate blunders, he was able to ship to the United States a group of 27 horses. Most of these were stud colts, an item easily and inexpensively procured from any horse breeder. 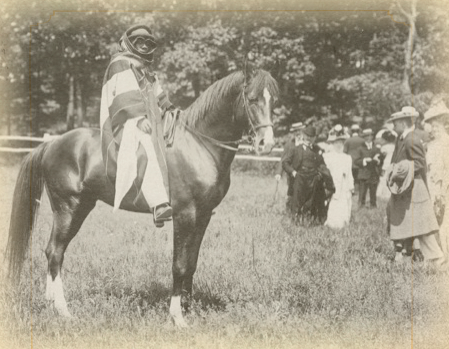 Also included, however, was a real prize: eight purebred Arabian mares, along with two 1906 fillies. Davenport was a political cartoonist, and it was thought that one of his cartoons was key to Theodore Roosevelt’s election in 1904. 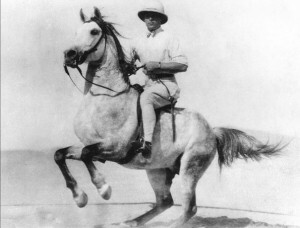 Thus President Roosevelt, a fellow horseman and interested in Arabians for cavalry breeding, was happy to lend diplomatic support to the expedition. Davenport’s partner in Arabian horse breeding was Boston industrialist Peter B. Bradley, who provided the financial backing. Inquiry though the Ottoman ambassador in Washington resulted in the Sultan’s issuing a permit (called an irade) for Davenport to export mares – an item illegal to export without special permission. Anxious to be on their way, Davenport and his two traveling companions left as soon as possible after the irade was issued. This meant they would be in the desert during the summer, when the migrating horse breeding tribes were in their northern pastures. And for some reason, in 1906 the tribes had swung a little farther north than usual. When Davenport arrived in Aleppo, he was not sure what to do next. But in a bazaar, he met two members of the Fidaan tribe, who told him their tribe was encamped just a few hour’s ride from Aleppo. One of them offered to conduct Davenport to the house of Akmet Haffez, a rich and powerful intermediary between the Ottoman government and the region’s Bedouin tribes. Being a man of action, Davenport went immediately to see Haffez. This was a violation of protocol. Davenport was carrying an Imperial irade and traveling under the aegis of President Roosevelt. Propriety dictated he first call on the region’s Ottoman governor, Nazim Pasha. 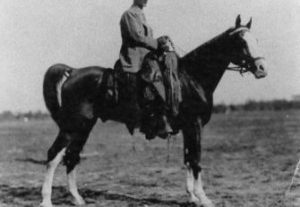 Haffez was so honored by Davenport’s visit that he presented two horses to the Davenport party and personally took charge of the expedition, accompanying Davenport out to the tribes, and assisting in negotiations. Davenport and Haffez became fast friends, and before the trip was out went through a blood brother ceremony which bound them together as family. Davenport died not even six years after his importation. 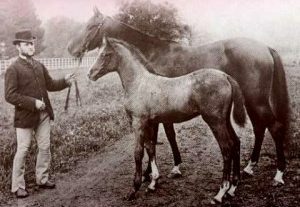 By then, however, most of the Davenport horses were located with Peter Bradley, who continued to breed them together until the 1920’s. Any bloodline this old should have long since been outcrossed out of existence. 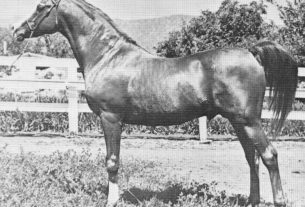 Yet enough people have recognized the importance of maintaining the Davenport bloodline, and bred enough foals along the way, that these horses have survived 90 years in the hands of American breeders – the majority of whom are bent on topcrossing to the latest imported outcross bloodline. The Davenports offer the intellectual fascination of having something unique in Arabian horses: animals tracing wholly to one of the breed’s foundation breeding groups. Their documented Bedouin origin is also unusual. Few other Arabian horses can show in every line uninterrupted descent from authenticated Bedouin stock. This heritage and background would be of lesser note if the Davenport horses themselves were not so eminently appealing. They meld complex, almost human brains with the conformation of a using horse and the lithe, graceful beauty inherent to all desert creatures. Naturally there is some variation within the Davenport herd: like snowflakes no two are exactly alike, yet all are recognizable as examples of Davenport breeding, and all look like Arabians. Most Davenport horses have been bred by people interested in a friendly, companionable riding horse with traditional Arabian type. These values attracted the owners to the Davenport bloodline in the first place, along with an awareness of their history. Thus they were more likely to select matings with an eye to perpetuating, rather than changing, the characteristics of Davenport horses. All Davenports are not equal, but the most glorious of them have never been surpassed as examples of the traditional Arabian horse. Be sure to visit the Davenport Arabian Horse Conservancy at www.davenporthorses.org to learn more about Davenport Arabians!